Thanks to Simon for the tip. Looking for a free SQLite database manager? Since developing for iPhone OS 3.0 I've been creating, editing and maintaining sqlite databases. The command-line tool "sqlite3" is quite nice to use but sometimes you just want a graphical editor. Mike Titlebaum has created the ridiculously literally named: "Mike T's SQLite Database Administrator Tool". It's free and even goes further than the basics to offer an import function, SQL query autocomplete, a comprehensive schema view and export functionality. You can also create new tables and edit data. It does have its quirks but for a free app it's worth a look. After installing Snow Leopard the eject button in the Finder for external hard disks occasionally fails. If you click eject and nothing happens (repeatedly) the solution is to right-click on the drive and choose the "Eject" menu entry. This will just about always eject the disk (unless it's still spinning up and Finder is waiting for the control signal to kick in). You would think the selectors for the widget and menu item are the same, but they mustn't be. I thought I'd mention it here in case anyone else had the problem. Convert any text to your own mp3 automatically! I heard Andy Ihnatko on MacBreak Weekly saying you could convert any text to an audio clip using an automator action in the services menu. This is handy for any time you want to hear something read back to you but listen on your iPod (in the car, for example). Andy was right - this is an awesome feature of Snow Leopard. Here's how to do it. Make sure the service receives "text" in "any application"
To save space, check "Delete source files after encoding". Click Save, call the service "Text to mp3"
The service will now be available. To test, go to mail, highlight some text and choose from the menu: "Mail | Services | Text to mp3". 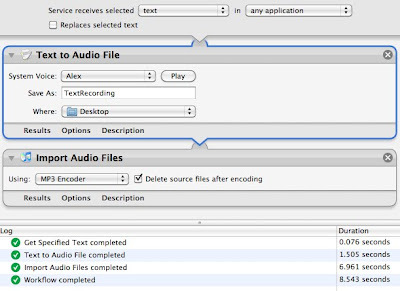 The automator action will take the text, convert it to speech and convert that to an mp3 file in iTunes. The file can then be played straight away or synced to your iPod or media player. If you want to run the automator action, search for "Get Specified Text" from the Actions pane and drag "Get Specified Text" above the "Text to Audio File" action. This will let you type text and run the workflow in Automator. You will have to remove the "Get Specified Text" action to save the workflow as a service. Thanks Andy and thanks Apple for this amazing, easy feature. 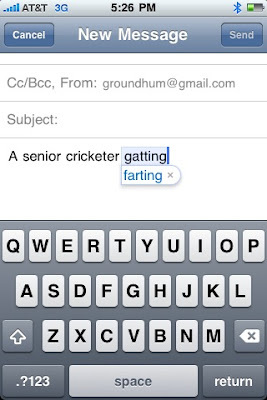 The iPhone's auto-correct mechanism makes Gatting (a famous English cricketer) out to be an arse. As you can imagine, Australians particularly like this joke. Gatting auto-corrects to be farting. The keys are close together... many thanks to my Aussie friend Michael for pointing this out. I found out that Parallels 3.0 doesn't work with Snow Leopard when I tried running it today. This is highly annoying because version 4.0 costs $50 to upgrade. If you don't upgrade, your virtual machines will be inaccessible under Snow Leopard. Parallels will not support version 3.0 under Snow Leopard in the future according to their website. So I'm stuck with the forced upgrade. I wonder how many other customers feel annoyed at being forced to spend $50. Not cool Parallels and not appreciated. VMWare Fusion works fine on Snow Leopard. I'll be moving my machine to that as soon as I can. Ok, this is trivial but how do you empty the trash using a keyboard shortcut? empties the trash with prompt. empties the trash WITHOUT a prompt. Note: A friendly warning, if you rely on this too much, it'll become a habit so beware! You might lose something you want. The most annoying Xcode error ever: The Info.plist for application at (null) specifies a CFBundleExecutable of (null), which does not exist. In Xcode, choose "Executables" from the project hierarchy. Click your project executable then press Command-I. Choose the General tab and set the working directory to "Build Products directory". "Changing an iPhone Executable's working directory from “Build Products directory” may cause the application not to install properly with the error message “The Info.plist for application at (null) specifies a CFBundleExecutable of (null), which does not exist.”"
Hope this saves you a little time. It frustrated me for a while.